Today it’s 1. December and we officially start the countdown to Christmas. Along with entering this special time of the year, we are thrilled to introduce you to our new website layout! But that’s not all: we also prepared a musical Advent Calendar for you! Starting today, we will be adding 1 Danish song each day to our Advent playlist on Spotify, so by the 24. December you’ll have a lovely winter/Christmas songs collection to enjoy during holidays. There will be something old and something new, something Christmas’ish and something less literally connected to this time of the year, yet all in all – we hope you’ll find some nice music to enjoy the wait for the first star on the sky on Christmas Eve. 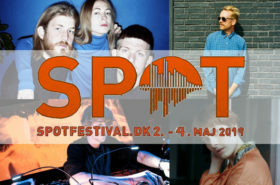 Enjoy listening, keep an eye on the playlist for more and check out our brand new website for more awesome Danish music (now presented to you in a new fancy way ;) ). We start with a song that is one of the Christmas anthems of all times – “All I Want For Christmas” – this time in a cover of a Danish wonderful band Figurines. Some winter days (and especially – nights) are perfect to dive into thoughts and fly away with your mind. The Attic Sleeper’s “When the Moon (December)” can set up the right atmosphere for that. Are you feeling Jack Frost on your nose already? For a winter Sunday evening, first Sunday of Advent, let yourself dive into the music of Efterklang and their song “Cutting Ice To Snow”. Special time requires a special soundtrack. Mew always delivers in that regard – also for Christmas. Start your week well and make Monday magical by listening to Mew‘s very wintery song – “She Came Home For Christmas”. It’s this special time of the year when we can observe the quiet, but noticible change in the world. Think about it today, while listening to “Changing of Seasons” by one of Good because Danish favorite singers-songwrites: Ida Wenøe. Today is St. Nicholas day, a joyful pre-Christmas celebration with small gifts and kids being happy of getting sweet treats. The adults though, in the globalization time and unstable world often feel the best gift of all is to be “Home for Christmas”, as Vida Sophia sings in her new song. We wish all of you just that – so there was always home to go back to for Christmas. Christmas time usually means – snow and frost, however, in the changing climate this view of December weather is modifying as well. If you miss snow and cold, you can find a hint of it in “We are the Arctic” from Small Time Giants. Are you waiting impatiently for some snow to come or can you already see the winter wonderland? Either way, enjoy the Danish darlings Ulige Numre‘s song “Navn I Sne” and have an awesome sedond weekend of Advent! Line Bøgh brings us another song on the Advent Playlist 2017. May the “Yellow Moon” take you to a journey through sound and words. Second Sunday of Advent has arrived. Along with it, a peaceful morning. We listen to Konni Kass’ “Time” today and hope to find a way to contemplate our blessings in the crazy, pre-Christmas chaos, when it’s sometimes easy to lose what’s truly magical about this time of the year. Christmas time is special for many reasons, one of them – at least to us at Good because Danish – is the fact that our favorite bands prepare some magical themed songs. Like “It’s Christmas” from Cody, which we enjoy today and wish you a great Advent week! 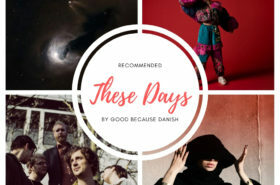 As our website is called Good because Danish, we would like to present you to music also sang in the interesting Danish language. A wonderful example of Christmas song with Danish lyrics is today’s Advent Playlist tune – “De Juleløse Holder Jul” by Katinka. Enjoy! We all look for shelter sometimes. In the middle of a busy week, the good (because Danish) music can be just that. To run away from the noise of the world, to count our blessings of the passing year and to enjoy the blissful Advent time for once, we listen to Turboweekend‘s cover of Talking Heads today and dream of “Heaven”. As we approach Christmas, we’re busy with planning: buying the presents, preparing the food, cleaning etc. Some of us already think about what comes after Christmas Eve, another very important Eve. The New Year’s one. Today we present Blaue Blume‘s song “On New Year’s Eve” to you and we hope while listening to it, you can think a bit about the passing year and count your blessings, but also – look into the future and the New Year with hope. Christmas time is for many of us the time to spend with families and friends. Hug your close ones today, check up on friends, let them know you’re there for them; listen to Tomas Barfod‘s “Family” (feat. Jonas Smith). And remember: good deeds come back to us, one way or another. If you feel the need for some cold, icey tunes, today’s Advent Calendar playlist song is perfect for you. The classy guitar sounds, the edgy vocals and the band’s name itself – North Fall – bring some true winter’ish atmosphere to your speakers with “To an Ice Age”. We agree with Rasmus Seebach – “Er Noget i December” (there is something in December). The last month of the year is special, we wish you a great 3rd Sunday of Advent and we hope you’ll do some nice December activities today! It’s aaaaalmost Christmas! Do you feel it in the air? We definitely feel the spirit of Christmas in the new Nelson Can song “Break Down Your Walls”. Enjoy listening to it and have a great week! “Piece by piece you put me together, ’til I am no longer broken” – signs Eivør in her touching, beautiful ballad. We share the original version of the song “Petti Fyri Petti” with you today (you can listen to the English version here). There is always someone who cares and who’s there to put us together. Even though they are bunnies, Sleep Party People have many wonderful, Christmas- and winter-themed songs in their music library. We share one of them with you today. Fly away to a bizzare wonderland with “Our Falling Snow”. Christmas time is not always a joyful time. 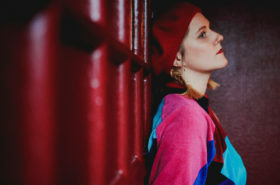 The hustle, the rush, the loneliness… if you feel overwhelmed by any of it, take a moment today to stop and take a deep breath with Penny Police lovely quiet song “Slow Down Sofie”. Can you feel it? Can you smell it in the air? It’s almost Christmas Eve! Today we dance a little bit (inside) from joy with MØ and her “Final Song”. It is “Christmas on Earth”! … Almost. Today we invite you to take a few minutes and listen to the new Christmas song from Marching Church. It’s finally here, the day (and night) we’ve been waiting for. We wish you everything what’s good and merry! Have “Enhelt fantastisk jul”, as Nikolaj Nørlund and Giana Factory sing. 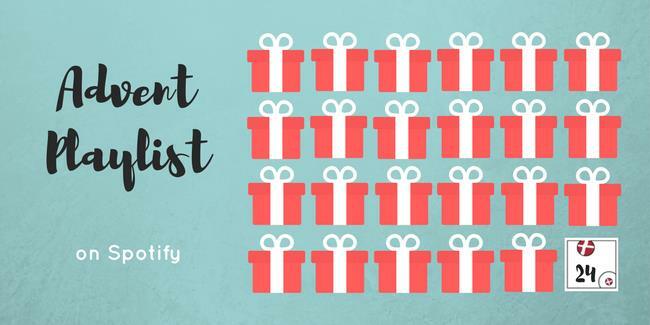 We ope our Advent Calendar playlist will help you in creating a magical atmosphere!